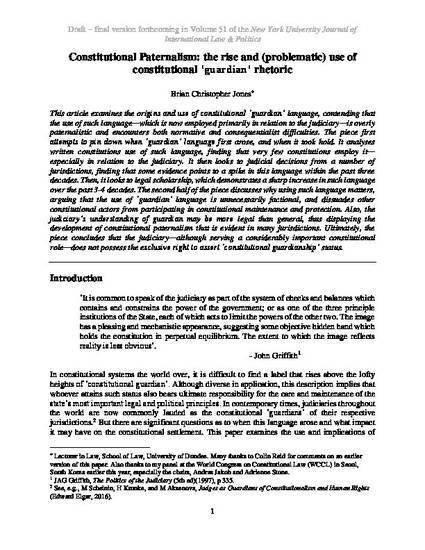 This article examines the origins and use of constitutional ‘guardian’ language, contending that the use of such language—which is now employed primarily in relation to the judiciary—is overly paternalistic and encounters both normative and consequentialist difficulties. The piece first attempts to pin down when ‘guardian’ language first arose, and when it took hold. It analyses written constitutions use of such language, finding that very few constitutions employ it—especially in relation to the judiciary. It then looks to judicial decisions from a number of jurisdictions, finding that some evidence points to a spike in this language within the past three decades. Then, it looks to legal scholarship, which demonstrates a sharp increase in such language over the past 3-4 decades. The second half of the piece discusses why using such language matters, arguing that the use of ‘guardian’ language is unnecessarily factional, and dissuades other constitutional actors from participating in constitutional maintenance and protection. Also, the judiciary’s understanding of guardian may be more legal than general, thus displaying the development of constitutional paternalism that is evident in many jurisdictions. Ultimately, the piece concludes that the judiciary—although serving a considerably important constitutional role—does not possess the exclusive right to assert ‘constitutional guardianship’ status. Draft - final version forthcoming in Volume 51 of the NYU Journal of International Law & Politics.